I have used webOS (yes, the “w” is lowercase) since getting my Pre+ smartphone in February of 2010 and love it. webOS has always gotten great reviews from technology writers and reviewers, but Palm never marketed it correctly. HP bought Palm in April of 2010, mainly for webOS, and promised to go all out with the operating system. They just launched the Veer (a very small, but powerful, smartphone) and the TouchPad tablet and the Pre3 is on the way. They are heavily marketing webOS and the new devices and have even talked about using webOS on full computers. I bought the TouchPad on the early launch day, July 1st and love it! I had a chance to use one at HP's booth at ISTE11 and loved it. Having been a webOS user for the last 2 years, using the TouchPad required almost no learning curve. It’s a little thicker and heavier than the iPad2, but not noticeable to me (I’ve used an iPad2 before and held one at the Best Buy store and compared them). It’s black and nice and shiny, which shows finger prints, but HP includes a nice cloth to wipe off the fingerprints that every touchscreen device gets. Currently there is only a WiFi version, but 3G versions are planned. You can also tether the TouchPad to your smartphone. The suggested retail price is 16GB for $499.99 and 32GB for $599.99, but most retailers are offering deals or lower prices. If you already own a webOS phone, you can get a $50 rebate when you purchase a TouchPad. webOS is really easy to use and very intuitive, using cards (like windows or tabs) to do true multi-tasking. Setting up the device was a breeze, especially since it connected to my Palm (now HP) profile where my Pre+ data and settings was synced to and automatically brought in my apps and connections. The profile can be used on more than one device so a school could set up one profile to keep all of the devices set up the same. webOS and the TouchPad have some very cool features that make them very easy to use and very useful. Virtual on-screen keyboard - easy to use, three sizes, and has a number row always visible. There are thousands of apps for webOS and you can use the smartphone apps on the TouchPad. More apps come out every day. I can do everything I need to do. Amazon Kindle, QuickOffice, Facebook, Spaz (Twitter - similar to Tweetdeck), calendar, email, memos, Acrobat reader, Maps (Bing), Music, HP Movie Store, HP Play Music app, TapNote, Angry Birds, Pandora, Evernote, and much more. Web browser supports Flash - and it works great. A huge number of website still use Flash and the browser lets you view these sites (unlike the iPad and iOS). This is important to me because many of the educational sites I use and virtual labs are Flash based. It’s also cool to watch YouTube videos on the YouTube page just like on your computer. It also allows you to watch Discovery Education Streaming videos right in your browser. Google works - all of the Google applications I use work great in the browser including Docs, Blogger and Google+. No need for any special apps. True Multi-tasking - webOS allows true multi-tasking using cards for each app (Iike a window). It’s extremely simple to view all open apps and select one or even close it using simple gestures. Apps run in the background just like on your PC. This makes it very easy to get work done and jump from app to app. Stereo speakers, headphone jack, power button, home button (can use gesture to get to home also), and volume buttons. Synergy - syncs and brings together all your contacts from your email systems and even Facebook as well as your calendars. Messaging - natively supports Google Talk, AIM, Skype audio and video calls, Yahoo! Messenger and future third-party apps. 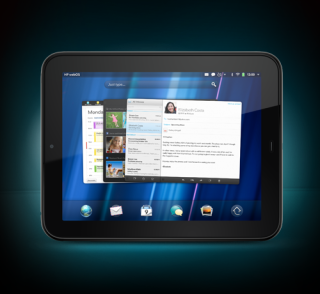 TouchPad owners who also have a webOS smartphone can send and receive text messages from the application as well. QuickOffice - view and edit office documents using QuickOffice. Links directly to Dropbox also. Wireless keyboard - connect via Bluetooth to the TouchPad. Set your TouchPad on the TouchStone charger and use the keyboard or bring the keyboard with you. Email - allows multiple accounts, including Gmail and Exchange, and you can view all your inboxes together or separately. Large developer base and homebrew community. HP embraces “jailbreaking” which isn’t actually needed - and homebrew developers. Notifications - notifications are unobtrusive and appear at the top of the screen. They do not interrupt what you are doing. Email, Facebook notifications, Twitter, and many other apps use the notification system. Just Type - just type on the main screen and it will search your apps, contacts, web history and Google for what you are looking for. You can even start an email or open othe apps from it. Beats Audio - the TouchPad has Beats Audio which is a very impressive audio system. The built-in stereo speakers are excellent, but it sounds even better on your headphones. Entertainment - TV shows, movies, and more through Hulu, HBO on the Go and more. Connect to your webOS smartphone - the TouchPad can connect to your Veer or Pre3 (or other webOS smartphones) and you can access your text messages and even make phone calls on your TouchPad. Leave your phone on your charger and just use the TouchPad. Touch to Share - just touch the Veer or Pre3 to the Touchpad and transfer what you were doing from one device to the other. For instance, you are looking up directions or information on your TouchPad and then want to head out the door and leave the TouchPad at home. Just touch the phone to the TouchPad and transfer the website over to the phone. Butler Service - free 90-day HP webOS Butler Service to help you setup and use your device. webOS is easy to use and allows multitasking. The browser supports Flash and works great with Google and other web apps. The TouchPad is sturdy and well built. There are tons of apps. Updates are done over the air so you don’t need to plug it into a computer. It Works Like Nothing Else. I really is a great device for education. Best Resource for Everything webOS: Precentral.net - resources, reviews, tips, community forum, and much more. Conclusion - I love webOS and think it is truly the best mobile operating system around. The TouchPad is pretty awesome and allows me to do everything I need to do with a computer, whether work, school, or fun. I highly recommend it as a tablet and I highly recommend checking out the Veer and Pre3 as smartphones. (I wrote this article in Google Docs and then posted it on Blogger all from my TouchPad). HP Buys Palm - What could that mean for education? (Disclaimer - I did NOT receive any compensation from HP for this review).